Kelandria and Randy Odom represent MAM with other Carnival charity recipients. I’ve been to a lot of parties, but this year’s Krewes for Kids party was outstanding. 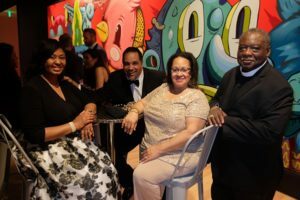 The Carnival Memphis event was held April 28th at the Crosstown Concourse. It was beautiful. More than 450 people attended. The energy in the room was amazing. This year’s Carnival Memphis Children’s Charities are Agape Child & Family Services Inc., Emmanuel Center and Memphis Athletic Ministries. More Carnival Memphis fun was held at the Secret Order of the Boll Weevil’s annual party. These are the Carnival merrymakers, who wear masks with long snouts and dress in green. They prove it’s easy – and fun – to be green. The party was held May 12 at the new Avon Acres event center at the rear of the Central BBQ on Summer.